The WordPress.com community creates, collectively, over a million posts every single day, generating an endless wealth of information and opinion. This shouldn’t deter you from looking for content to enhance your blog. On the contrary, you can discover great material by employing some of the following tactics (we use these, too, to find our Discover editors’ picks!). Rely on the Reader. If you’ve already found — and decided to follow — blogs that fit into your web of interests, your Reader is likely brimming with posts that merit a greater audience. Stumbled upon a great read? Sharing another blogger’s post is extremely easy — in fact, you can do it directly from the Reader. Just click Reblog at the bottom of the post (or excerpt), and, while you’re at it, add your own commentary to start a conversation. Use topic search. If you’re new to blogging or looking to branch out from your regular reads, searching for specific topics can lead to some exciting finds. Whenever you use the topic search box, you automatically add the topic you were looking for to a list on the Reader sidebar. You can then easily review the same topics on future visits. Follow, follow, follow. While topic-searching, you’re sure to stumble upon many bloggers who share your interests, and whose posts you can directly reblog from the results list. Don’t forget to follow the blogs you liked (just click Follow, right next to Reblog): this way, new posts from these sites will show up automatically whenever you visit the Reader. Build your network. Just as you would collect book tips from people who have similar tastes to yours, tapping into the shared wisdom of like-minded bloggers can lead you to discover great content. Did you find a post particularly engaging? Check out the writer’s Blogroll and hunt for new blogs to visit; it’s also a good way to build a Blogroll of your own. Left a comment on a post? Read the rest of the comment section to look for people whose writing resonates with yours. Even a great art collection will look faded in a dark corridor. Now that you’ve amassed great findings for your blog, present them in a way that honors them. For inspiration, you can look at some blogs that already do a fine job showcasing curated materials, like Submitted for Your Perusal and hovercraft doggy. Here are some of the tricks that make these, and other curation-heavy blogs, successful. Choose the right theme. The first major step is to choose a theme that plays into your content’s strengths. While virtually all themes will allow you to incorporate text and images into your posts, some are particularly tailored to the work of a blogger-curator. Have you cultivated an interest in finding great images to feature next to your own? 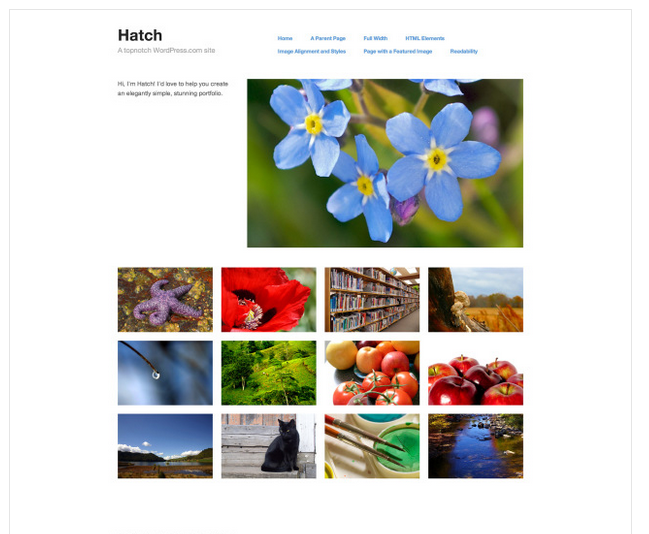 Pick one of the beautiful gallery-style themes available, like Visual or Hatch. Are you more into finding and presenting great writing from across WordPress.com? Several magazine-style themes, like Esquire or Sight, allow you to present text (as well as other media) with a sleek look. Quoting is a welcome form of praise. Occasionally, instead of reblogging an entire post, you might prefer sharing just a nugget of particular interest. Some themes offer a Quote Post Format, designed specifically to highlight the chosen text (to see if your theme supports this format, from your Dashboard click Posts >> Add New. A sidebar box will show all available formats for your theme). Blockquote is always an option. Even in themes that do not offer this post format, you can use the Blockquote tag in the visual editor to foreground the quoted text and separate it from the rest of your writing. Give credit where credit is due. No one likes to see their hard work used by someone else without attribution. When you reblog an entire post, the original blog will automatically be mentioned in your own post, and you can add more information in the text box that opens when you click Reblog. Citing your source is just as easy when you quote, or use someone’s else’s image. Simply add the source in the caption (for an image) or following the borrowed text (for a quote), and link to the source. Getting inspiration from others’ work and paying others tribute will make your own content stronger — soon enough, you might find your own posts quoted by your own favorite bloggers. Great ideas. I haven’t used blogroll before, wasn’t quite sure what it was. Now I know! Thanks, Ben, great and accessible (part of being great!) info. 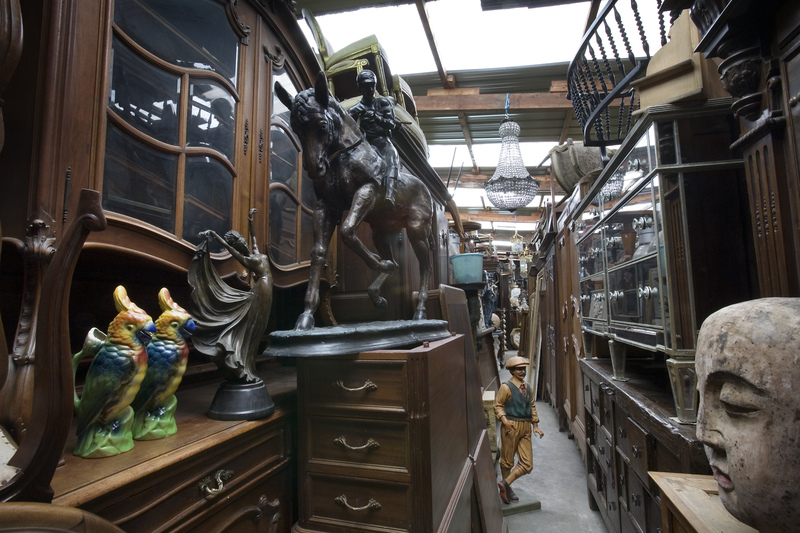 As a former “real-life” museum curator, you state the pursuit very well…the treasure hunt for just the right content. And how one “work” relates to another to tell an overall story. Ben, Thank you for the useful insights and advise. I am new to blogging and this post provided a very thoughtful and provoking analogy to blogging. It challenges me to not only be a better blogger with interacting with the blogs that I appreciate and follow, but in building a foundation for my own interaction with my blog. Thanks again. In fact I find material for another blog I do all the time, so I would have to say that the Reader is an awesome resource. I’m not sure I understand about reblogging someone else’s entire post. Isn’t that a form of plagiarism if you repost without permission? I’m a publishing professional and it is my understanding you can quote one or two sentences with attribution but anything more than that requires written permission. Hi Michelle, thanks for your comment — you raise a very important point, which I’m happy to clarify. Reblogging does not actually mean that the entire post appears on your own blog, but rather just the post’s title and an excerpt (and/or an image). This way, your blog is enriched by the other writer’s content, but you’re still encouraging people to visit the original blogger’s site. And a Reblog is automatically accompanied by a clear, unmistakable attribution, so nobody can claim your content as his or her own. Fascinating. Great truths with this post. Thanks for sharing; it’s always great to hear about something new and useful. Excellent phrase: bloggers as curators. A good metaphor to keep in mind as a blogger/writer. Wow, Ben, this is so full of helpful things for me to use. I want to use it as reference, thank you so much for sharing. Some great hints and tips, cheers for sharing this. Its always good to learn more about how wordpress works. Really like all of these suggestions. I need to keep coming back to this. I am definitely still learning about who, what, where, when and why. I am glad I received this. Thank you. Hi Ben, just one objection to this interesting post. Some blogs are not “curated”, ie: collections of cool stuff made by other people and rearranged into something personal. They are largely or entirely original content. Many of the people that put the effort into preparing material for their blogs want to be asked before someone else reblogs. It is not just a courtesy, it is potentially a copyright issue. So, my advice is before reblogging look around that blog to see if there are preferences stated because often there are, such as asking before doing. IMHO WP makes it far too easy to reblog. For instance: reblogging from Reader when you can’t see the whole post? What is the justification for that feature? Hi ephem, thanks for reading this post and joining the discussion! You’re absolutely right to mention that some blogs contain original content only (and these bloggers certainly deserve our respect). Other blogs are hybrids, mixing original material with curated content. I agree that bloggers should respect each other’s preferences as much as possible. This is how many in the WordPress.com community already go about the reblogging process. It’s also important to note, though, that when you publish on a public blog, it’s there for the entire world wide web to read, link to, and share. Reblogging was made easy, first, to allow great content to find new audiences. It’s also designed like this to guarantee that when others share your work they do so responsibly, using only a small excerpt of each post, and clearly attributing its source. That said, if you wish to have full control on who gets to see your blog, you have the option to change it to a private blog, and invite whichever readers you want, and them alone. It’s a tradeoff between greater visibility and greater control. I don’t disagree with a lot of what you say, and I think there are many interesting collections of reblogged material where the blogger is being creative and recontextualising things in well considered ways. But really Ben, to suggest the solution is to go private?!? That suggest I classify in with the kind of annoying chaff that politicians use for an answers. I will just take it as an indication that you have no answer justifying the ability to reblog from Reader without even looking at all of the post. To me, that feature only serves the rebloggers that are not being creative or thoughtful or careful or anything else. I had so many questions on how to blog. I am very excited about this and now after reading the other’s post I understand and this all makes sense. I am so glad Michelle asked her question as I was thinking the same thing. Thanks for your help and guidence. Thanks for sharing this! 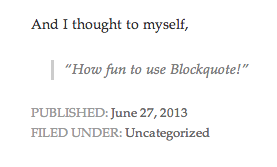 I never knew that thing I saw on another blogger’s blog is called blockquote! Now I know! And I know about the reblog thingy now, previously, I thought it would reappear as the entire thing on my post and wouldn’t even dare to try. I shall try from now on. Great post! That first paragraph is a wonderful description of a blog. I am, however, sorry to see reblogging encouraged; I remain opposed to it. Hi Ben. Love the analogy carefully designed museum-living room-coffee shop. A blog very often reflects the writer’s conscious/sub-conscious thoughts and personality -whether it is choosing your words or pictures – you are putting a part of yourself out there. So, when you write a post it is like inviting the reader into your world. I agree with Michelle and PiedType above, I do not agree with reblogging and I honestly do not understand the point. If you want interesting content on your blog then get off your backside and create some yourself instead of simply re-gurgitating somebody elses work. Many of my posts are technical posts about restoring vehicles, they often take many hours to produce including time taken to take photos of each stage of the refurbishment of a part of the old vehicle. That is on top of the time taken to do the vehicle refurbishment itself. If people find these posts interesting and want to mention a post on their blog they can simply put a link to my post within the body of their own content as I have done with others blogs on several occasions. Thanks for joining the discussion, mud4fun! As I mentioned to another commenter, it’s important to stress that reblogging using the Reblog feature does not mean that someone simply copy-pastes your content (that would be precisely what you said — regurgitating). On the contrary, when another blogger uses Reblog what’s shown on the his or her site is a short excerpt from your original post, as well as a link back to it. That way, if readers’ curiosity has been piqued they can easily visit your blog. Bloggers are very much encouraged to add their own perspective and commentary to anything they reblog (indeed, few people would choose to visit and read a blog made entirely of reblogged material). I’ll also add that if having tight control over the viewership of your blog is crucial to you, you can choose to change your public blog’s setting to private. You’re likely to have less visitors, but you’ll have much more control over who sees your work. A great article, this one, and I so much wish I’d seen it when I started out. It just happens I quoted another blogger recently and felt fear of “using their words” without permission – it was only a sentence, mind – but as you say, it is indeed a great form of flattery. It complemented what I was saying & I said “great quote, great blog”. All of these pointers are brilliant. Hopefully WordPress won’t be plagued by people who consciously use wrong grammar like on Tumblr when they reblog (e.g. I am cry. I am disappoint) It’s considered cool these days to sound like a two-year old toddler, apparently. I have been suggesting the Reader and adding topics on it to other bloggers for a while now. It amazes me that so many have no idea what I’m talking about. I’m on it everyday and thoroughly enjoy it. I think it’s only natural that people take some time to discover all the great features available to them, especially when they’ve just started blogging and want to focus on creating their posts. That said, I’m very happy to hear you’re a frequent Reader and Topic Search user! Hi Ben, thanks for the reply. I’m quite happy having my content public, after all my content is designed to help others who are doing similar rebuilds or restorations. I appreciate that once public it may be viewed and copied by not just my intended audience (my fellow classic Land Rover fans) but by anybody worldwide. I understand the reblog feature in the sense of how it works, I just consider it a rather lazy or ignorant way to operate. Possibly because of my upbringing. I much prefer to see genuine original content with the odd link to other blogs or websites as sources etc rather than, as is often the case with re-blogged stuff I’ve seen, simply to reblog something with not so much as a thank you or covering paragraph by the reblogger. I associate “curating” with collecting and perserving the original content and attribution to the content’s writer/creator. The curator is selecting stuff based on whatever criteria they choose for their little virtual collection. Real value of good curating for a blog post is to explain /highlight to a reader in choice words and by theme of the content that you chose from someone’s else web site or blog. Love to hear from others how different is curating from the tradition of scrapbooking. Or maybe those who don’t do research can’t see the difference. Thanks for your insights — agree that curation involves much more than just compiling links. Some of the most effective curators on the web shape their collections and compilations with a specific eye and style (or, as you said, criteria), using their own passions and curiosities to drive their selections. Thanks for all the useful insight! Ben, there is one other issue with re-blogging that I didn’t mention above as currently it doesn’t affect me and that is stealing peoples hits. As I see it, if somebody re-blogs a post then they will have the reblog appear higher up the list in the reader than the orginal content. If the person who had worked hard to produce that original content pays for your Ads option then potentially the re-blogger will get the hits and advertising revenue instead of the original creator of that content. This would amlost certainly be true for those that post photographs. From what you say, the re-blog will grab that lead photo and use it. Once a visitor has seen the photo on the re-blog (and the re-blogger has gained a hit and ad revenue from it) there is less chance that the visitor will click into the same photo further down the reader as they will have already seen it. I am actually about to upgrade my account to get premium in order to get video facility etc and am considering applying for the Ads package. If I did that amd once I was potentially earning money, no matter how tiny an amount, from the original content that I’ve worked hard to produce then I would be even more upset if somebody re-blogged it and stole a potential visit from me. I agree with comments above, I really think the re-blog feature should be removed from the reader and only be available from within a post AND the re-blog should only happen once authorised by the creator of the original content. Surely this is relatively simple to do as it will behave much like any new comments from new visitors, their first comment requires moderation and approval by me before it appears. I think this would then satisfy all of us here that have concerns over the re-blog functionality. Hello again, mud4fun, and thanks for stating your point with such care – I’ve really enjoyed reading the discussion generated by this post, not in the least your take on the Reblog feature. I think it’s worth mentioning again that even when reblogged, the original content can only be viewed in its entirety on the original blog, so in the vast majority of cases the person who worked hard to create a post will get the ad revenue generated by the content (assuming, of course, that the blog in question features Ads). In other words, if a reader wants to see the whole post it doesn’t matter whether the excerpt appeared in the Reader through an original post or through a reblog. In fact, one can argue that a reblog actually increases a post’s visibility in the Reader (and, consequently, can increase click-throughs to the original blog). One case you mention where I completely see your point is when a post’s content can be viewed in its entirety on the Reader (i.e. a very short text or a single image). In this case, though, I think that the effect of the reblog is quite muted, because most readers are unlikely to click through to a post that can already be seen in full on the Reader. Likewise, I’d imagine any lost revenue due to the reblog — if any — will be extremely minimal. Lastly, the kind of points you make here will be much appreciated on the Ideas forum, where members of the community chime in on the various features of WordPress.com. While these discussions might not lead to immediate changes, they count, and they help build a stronger community, where bloggers’ voices are heard and taken into account. I think it important to note that some themes offer different post formats on the sidebar of the “new post” window, but in actual appearance, there might be little or no discernible difference. Thanks Ben. Helpful guide to important features. I will be referencing this post as my blog expands. I am a sculptor and I am new to blogging, I am reading with interest the points raised about reblogging and using material from blogs. I use my blog to show some projects I am involved in, recently some one took a lot of images from my blog and turned them into a video, even though the work is credited to me I would have appreciated it if they had asked permission, apart form politeness, had there been some collaboration it might have opened up possibilities of using other material, perhaps a product that was more rounded out and the possibility of a more positive creative experience. private blog or no will always be a dilemma…. Great content, Ben. As a new blogger this information is key to being successful. Agreed to all the discussion. Creating content and unique content is the most important thing for a blog. Bloggers with abilities to write their contents on their own and make that content look eye catching either by putting images, cross questions, controversies or anything which attracts users are likely to earn most from the internet. I also created my tale of survival in Dubai blog (http://firsttraveltodubai.wordpress.com) though i started with a good way but I soon ran out of ideas, now I am again thinking of niche. Thanks for sharing Ben!! Great content for new bloggers. Thanks for sharing Ben!! Great content for new bloggers. See my site!!! Taking the “Follow, follow, follow.” advice to the next level: I subscribe via RSS using Feedly (previously Google Reader) to over one hundred blogs related to my curation topics. I have found this method the best way to stay current with news, events and topics of interest. Great Reading thank you for your information on this subject. Great points to ponder. I run multiple food blogs and last year started one about bricks. As a (non practicing) librarian, blogs can be a great source or specialized information and pathfinders in some subject fields. Also good for collaboration. Great article, I just started posting regularly to my blog and am more of a Curator / Blogger, thanks for the advice.